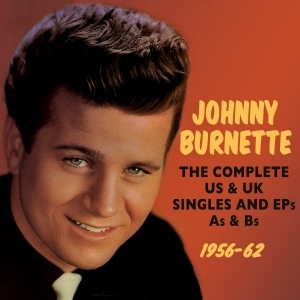 Johnny Burnette is best known as the teen idol late era rock ‘n’ roller, whose Top 5 hits with “Dreamin’” and “You’re Sixteen” typified the lightier, poppier direction that rock ‘n’ roll took at the start of the ‘60s. However, his roots were in the country rockabilly music of the mid-50s, when he featured with his brother and songwriting partner Dorsey Burnette in The Rock ‘n’ Roll Trio. Although the perceived wisdom is that most rock ‘n’ rollers relied on Tin Pan Alley for their songs, the Burnette brothers wrote the majority of their own material, and Johnny’s talent was much broader than some of his contemporaries. This collection provides a thorough trawl through all the singles he released under his own name in the USA and UK through to 1962 from his 1956 debut on the tiny Von label through his time with Coral, Freedom and then Liberty, the label where he found success with the some of the first productions by the legendary Snuff Garrett, who introduced strings into Johnny’s recordings. It also includes by way of a bonus, the tracks from his EP releases in the UK and USA which did not appear on his single releases. It’s a great value 62-track 2-CD set, encapsulating the entirety of his chart career prior to his tragic early death in 1964 in a boating accident.